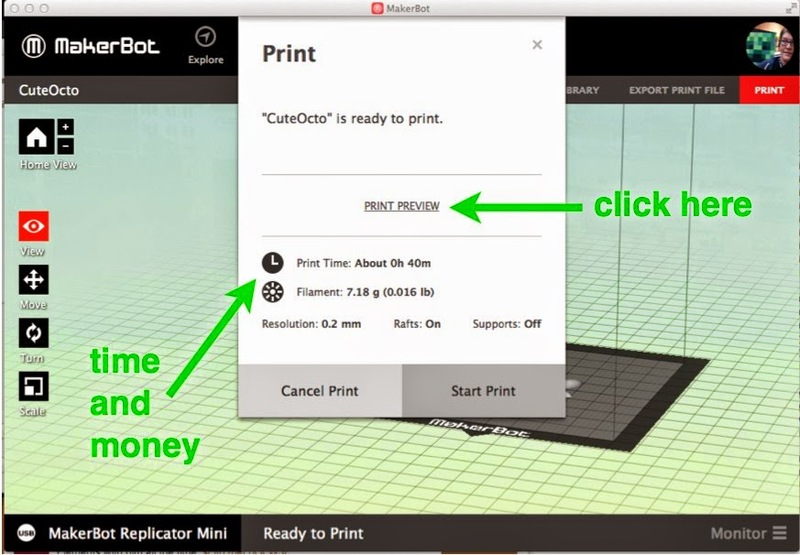 This is the second in a series of posts about getting started with 3D printing, and the printer we'll be using along this journey is the MakerBot Replicator Mini. If you have a different sort of printer I hope you can still get something out of these posts, although admittedly they are going to include a lot of Mini-specific walk-thoughs and technical hardware and software discussions, at least at first. The first thing I recommend printing on the Mini is Cute Octopus Says Hello, one of MakerBot's own designs on Thingiverse and the model they use for illustrating their filament colors. This is one of the simplest designs you could choose: it has no overhangs, nothing complicated, and it scales well. In fact we're going to print a mini-version at 50% scale. Our octopus-printing is going to be split over three days. Today is Level 1: Straight up easy. 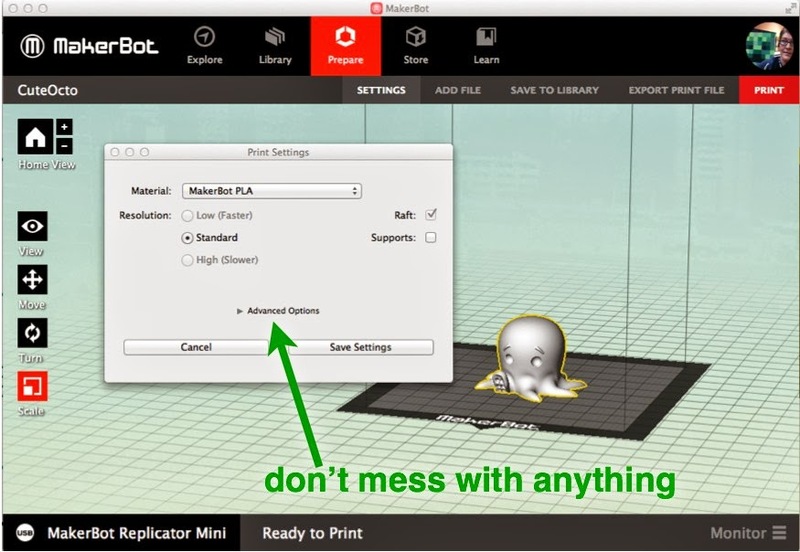 We'll print the octopus shown on the left in the picture above, with no special modifications or settings. Tomorrow and the next day we will level-up to changing some settings that speed up the print and use less filament. Step 1: Load the model. 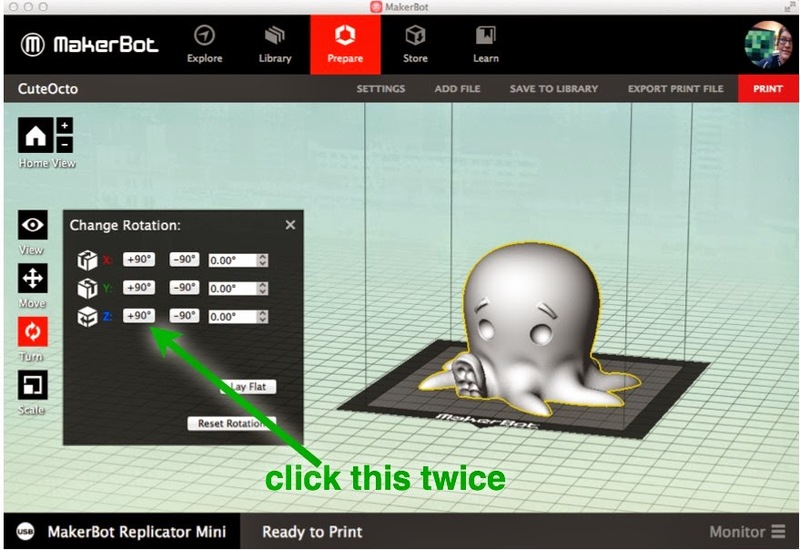 From the MakerBot Desktop software, click "Explore" and then search Thingiverse for "cute octopus says hello". The model we'll be using should be first in the list, and dated June 31, 2012. Click on the model and then click the red "Prepare" button to see the file. Then click the new "Prepare" button near that file to load it into the software. Step 2: Rotate the model. This isn't necessary but it seems kind of unfriendly for the octopus to face away from us, so we'll turn it around. Click on the octopus and then click on the "Turn" button. The bottom of the three options will rotate the model around the vertical z-axis. Click the third "+90" button two times to turn the octopus around. Step 3: Scale the model. 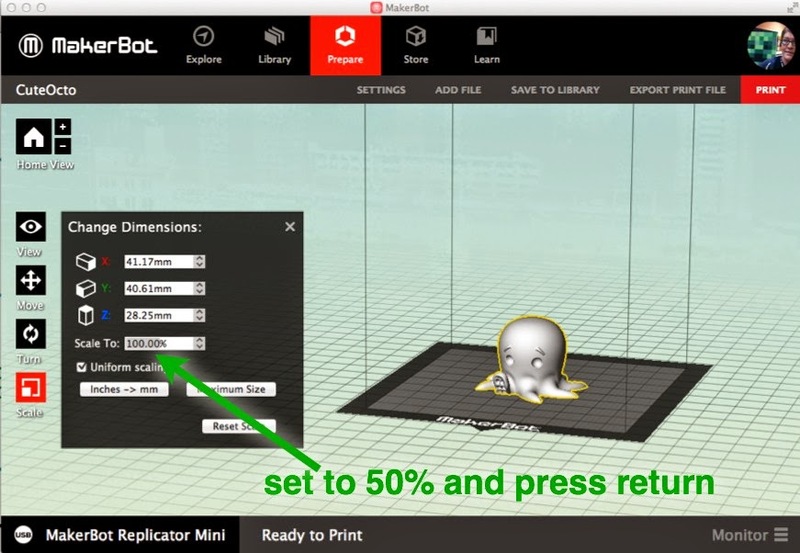 Since we're on a Mini we'll start by printing "mini" at 50% scale. Of course this will also make the print a lot faster; this is a linear decrease to 50% scale, so the volume will decrease by much more (we'll talk more about this later). Click on the "Scale" button, type in 50.00% percent in the "Scale To" box, and press Return/Enter. This is the easy day, remember? Let's color inside the lines for this first print, and not change anything under the "Settings" tab. Okay now you can press the red "Print" button. This will bring up a window that shows how much time and filament the print will cost you. Before printing click "Print Preview" so you can check out what the Mini will be doing as it prints. For a simple print like this one, we don't actually need to look at the Preview; it's just interesting. Move the vertical slider on the left of the window to see what the printer will do at various levels. This is perhaps clearest if you first click "View from Top" and then move the slider. At each level of the print the nozzle will follow the path shown at that level. The screenshot below shows a level around halfway up; you can see the eye indentations at this level. You can also see the vaguely hexagonal filler material in the center of the model. The slicing software uses this filler for any interior solid parts of your model, to save filament and time. The default settings are for the interior fill to take up 10% of the space, with the other 90% as empty space. We'll mess with the default settings later, but not today. When you're done looking at the Preview just click "Close" and then select "Start Print" to start your print. Or you could just stare at the printer for five minutes wondering why nothing is happening and then realize that even though you hit "Print" earlier you still have to hit "Start Print" now. That's how I did it and things turned out okay in the end. Step 7. Wait and watch and other stuff and then remove your print. After about 40 minutes (give or take 5-10 minutes and plus a five-minute warm-up), your print should be ready. Remove the build platform from the machine and then remove the model from the platform. Step 8. Remove the raft.